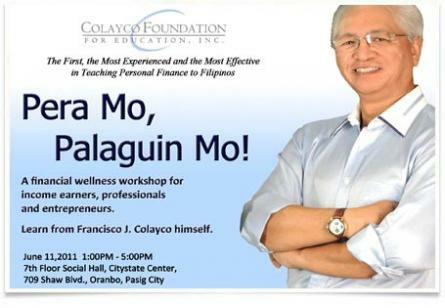 The Colayco Foundation for Education (CFE) will be having seminar-workshop about financial management entitled "Pera Mo, Palaguin Mo". Based on Francisco J. Colayco's book with the same name, this workshop will equip you with the skills to make your own Financial Plan to be Wealthy. It will also equip you with the right Investing Mindset. This workshop is recommended for those who are serious about taking control of their personal lives by preparing their own financial plan to be wealthy. • How to make your own financial plan using the following tools: Adjusting Your Sails Table, Statement of Assets and Liabilities, Personal Income and Expense Statement and Net Worth Planning. • Get the right Investing Mindset and an overview of investment instruments that you can consider depending on a particular financial circumstance. • This workshop includes a copy of Pera Palaguin Workbook which will serve as your guide to planning your financial life today and in the future. Seminar fee will be Php 3000. You can avail the 50% discount by getting the discount voucher. Please see the details below. • Voucher is valid for one (1) slot at Pera Mo! Palaguin Mo! 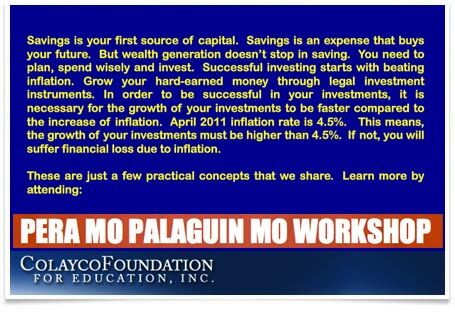 Workshop happening on June 11, 2011, Saturday, from 1:00PM to 5:00PM. - Voucher is transferable and may be given as gift. - Price is inclusive of all service charge and VAT. - All paid transactions are non refundable. - Voucher cannot be used in conjunction with any discount card or promotion. - Last call for reservations must be made three (3) days prior to the event. • Reservation is required at least three (3) days prior to seminar date. Non-reservation will result to forfeiture of voucher/s. • Cancellations must be made a day before the set appointment. Clients who don’t show up for their scheduled appointments will have their voucher/s forfeited. • In the event that the voucher is not redeemed, client may opt to consume the value on Book titles of Colayco Foundation up to June 31, 2011 only. What is Ensogo and How it Works? Ensogo is a FREE service that offers great deals of 50%-90% savings on the best things to enjoy, see, eat, and buy in Manila. How to Buy the Voucher? 1. Register and log-in to the site. 2. Choose the promo and perform the necessary actions. 3. Once complete voucher will be sent to your email.